How to Apply for Financial Help from Pakistan Bait-ul- Mal? Home » Technology News and Business Updates Of Pakistan » How to Apply for Financial Help from Pakistan Bait-ul- Mal? Everything about having the financial help from the Pakistan Bait-ul- Mal. Pakistan Bait-ul-Mal (PBM) is a charity and social welfare organisation established by the Government of Pakistan through a 1992 Act. It’s a semi-autonomous body set up significantly to help to poverty relief through its various projects. It is offering the financial help to the poor and needy with emphasis on rehabilitation. It is assisting the poor with the government funds all across the country. The PBM is especially helping the poor and needy who can’t afford to have the proper facilities. It is offering a number of projects for providing assistance to the destitute, widows, orphans, invalids, and other needy persons in the society. It is also the sponsor of Benazir Income Support Programme and offering the money to poor and deserving students of almost all universities of Pakistan. PBM is providing assistance to the destitute, widows, orphans, invalids, and other needy persons who are suffering from severe diseases and can’t afford to bear the expenses. Udder the Special Program PBM is offering the financial help to the poor people who are earning less than Rs.10,000 per month. Needy, orphans children and deserving students who can’t afford the higher professional education are being offered the Educational assistance. Providing the shelter homes to the elderly and homeless people. Offering the free medical treatment to the poor and deserving people by setting up free hospitals and rehabilitation centers. Providing the financial assistance and grants to benevolent institutions with educational & vocational training programs. PBM is also sponsor and promote self-employment schemes. Women Empowerment Centers have been established throughout the country in order to train the women in the fields of Computer, use of Office Equipment’s like Fax, Photocopiers, Printers, Interior Decoration, Beautician, Cooking, Tie & Dye and Glass Painting etc. 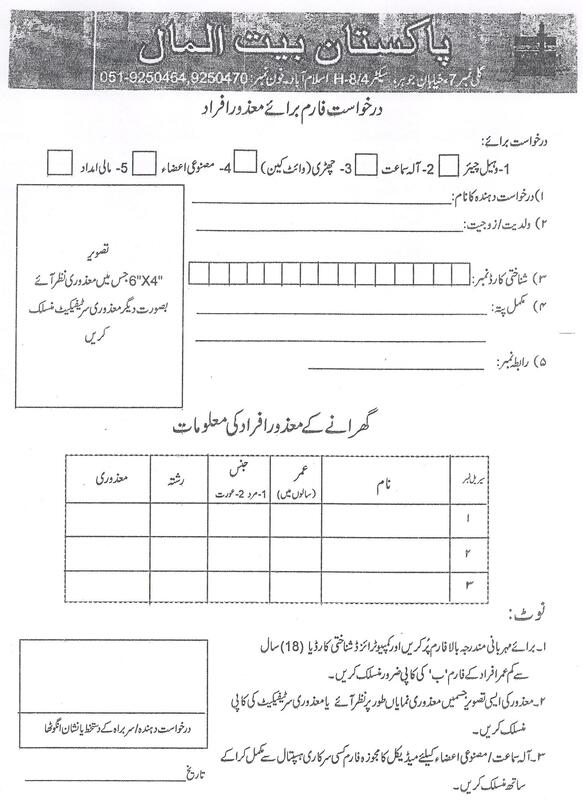 Here is how you can submit the application for getting the financial assistance from the Pakistan Bait-ul-Mal. The financial aid in the general assistance covers the widow, orphan, disable persons, needy and elderly people. All those needy widows, orphan girls and other women who want to earn livelihood can have the sewing machines under the Pakistan Bait-ul- Mal financial assistance. They just need to submit the handwritten application in the name of MD of PMB along with the CNIC card copy at the PBM office. All the eligible candidates will be provide the financial aid in the form of cross cheque. How to have the application form? You can have the application form from the PBM office and also online by visiting the official website. And get application number from the desk. The application number will help you tracking the status of your case. 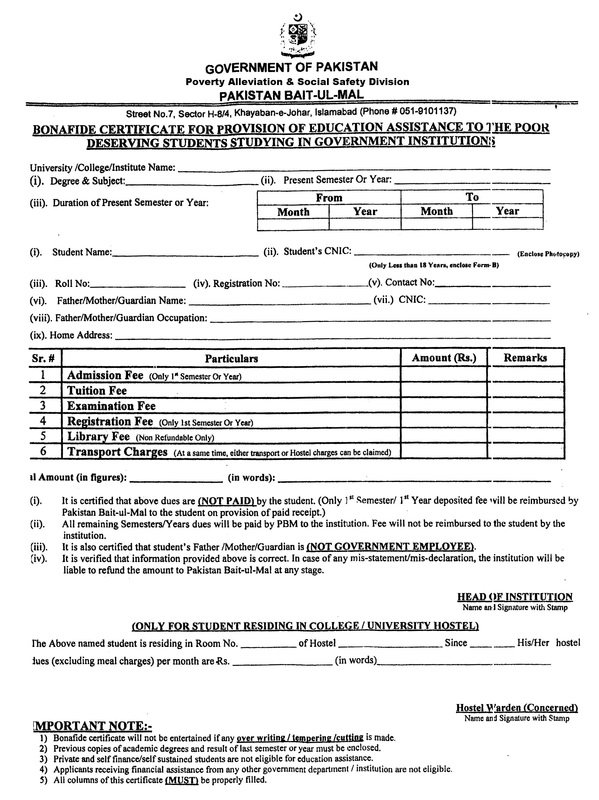 How to Get Pakistan Bait-ul- Mal Scholarship? How to Apply For JT Asia Scholarships for International Students 2018? 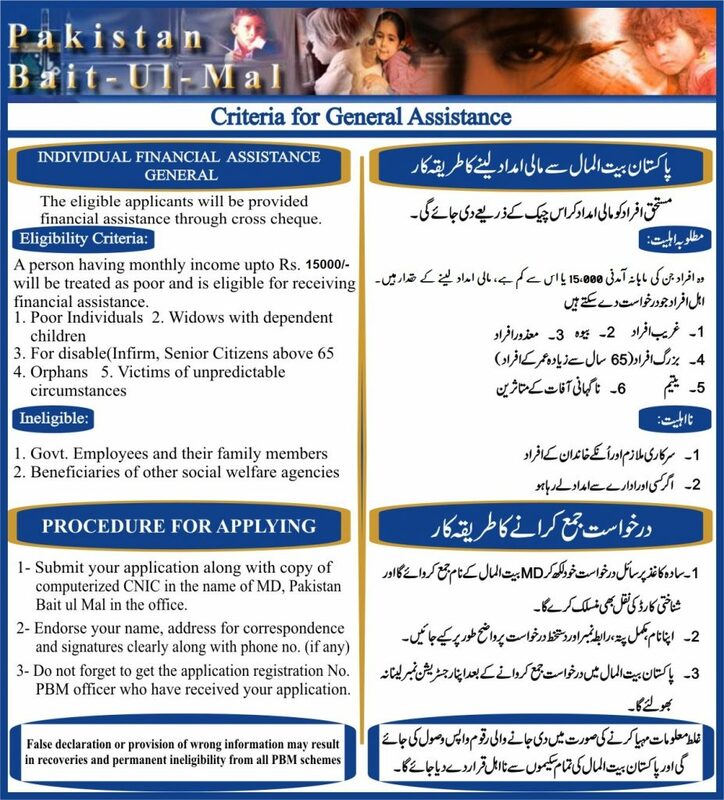 How to Apply for Financial Help from Pakistan Bait-ul- Mal? Everything about having the financial help from the Pakistan Bait-ul- Mal. Pakistan Bait-ul-Mal (PBM) is a charity and social welfare organisation established by the Government of Pakistan through a 1992 Act.